For the past six years, the Republic of Mali has been facing its most important crisis since it gained independence from France in 1960. In 2012, following the NATO-led intervention in Libya and the fall of Qhadafi’s regime, an unprecedented number of arms and amounts of money poured in to the Sahel region, eventually ending up in the hands of Tuareg separatists in northern Mali. The relationship between the Malian state and the Tuaregs has been a succession of insurrections with periods of precarious peace, but this time the conflict spiralled out of control and threatened the existence of the state itself. In April 2012, the National Movement of Liberation of Azawad declared the secession and independence of North Mali, and in March President Amadou Toumani Touré was ousted by the military for his inability to respond to the crisis. In the following months, France intervened on the invitation of the Malian state to stop the insurrection, the UN security Council approved the creation of a peace and stabilization mission, and peace negotiations started between the different parties involved in the conflict. 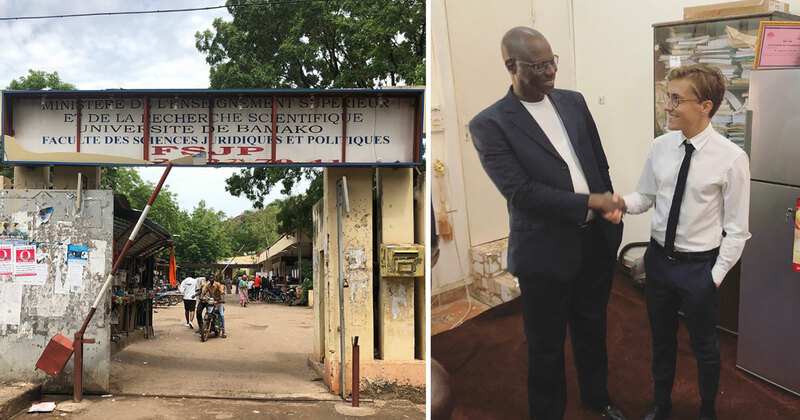 Thanks to the support of the Institute for Global Leadership, I was able to go to Bamako in order to research the Algiers Accords, peace accords that were brokered in 2015 between different coalitions of Tuaregs and the Malian government. This research project, part of my master’s thesis for The Fletcher School of Diplomacy, focuses on the shortcomings of the Algiers Accords and the difficulty of its implementation. The accords may be reaching a dead end if the situation does not change rapidly. As part of the interviews I am conducting with experts and actors on the peace process, I had the chance to meet with Professor Bakary Camara, Dean of the School of Public Law at the University of Bamako (Université des Sciences Juridiques et Politiques de Bamako). Prof. Camara, a former Fulbright Scholar, became an expert on land related conflict in Africa and policies of decentralization, collaborating with Professor Catherine Boone from the London School of Economics. In our discussion, he covered the different problems that the peace process is facing at the moment, focusing mainly on the topic of decentralization policies. He also discussed the increasingly militaristic and counter-terrorist approach taken by the international community, as well as the endemic issue of trafficking in the Sahel region. The post-colonial Malian state is in fact still modelled on the French state, a centralized and Jacobin form of state, which is arguably not suitable to the Malian geographic, cultural and ethnic diversity and divides. If terrorism and trafficking are indeed major contemporary problems, they are also the result of the inability of the Malian state to integrate politically its Northern population. The secessionist movements will only cease once the Tuaregs’ claim for political and economic autonomy are finally met. The Algiers Accords include the guarantee of an institutional evolution of the state and effective decentralization, but so far little of it has been implemented. An interesting comparison is to be made with the state of Niger, which seemingly more successfully tackled the challenge of territorial integration. The next step of my research project will explore that comparison and try to identify examples of mechanisms and strategies that could be implemented in Mali.